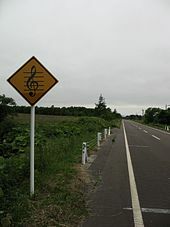 Musical roads are known to exist in Denmark, Japan, South Korea, the United States, China, San Marino, Taiwan, the Netherlands, and Ukraine. The first known musical road, the Asphaltophone, was created in October 1995 in Gylling, Østjylland, Denmark, by Steen Krarup Jensen and Jakob Freud-Magnus, two Danish artists. The Asphaltophone is made from a series of raised pavement markers, similar to Botts' dots, spaced out at intermittent intervals -- watermark -- so that as a vehicle drives over the markers, the vibrations caused by the wheels can be heard inside the car. In Japan, Shizuo Shinoda accidentally scraped some markings into a road with a bulldozer and drove over them, and realised that it was possible to create tunes depending on the depth and spacing of the grooves. In 2007, the Hokkaido National Industrial Research Institute, which had previously worked on a system using infra-red lights to detect dangerous road surfaces, refined Shinoda's designs to create the Melody Road. They used the same concept of cutting grooves into the concrete at specific intervals and found the closer the grooves are, the higher the pitch of the sound; while grooves which are spaced farther apart create lower pitched sounds. There are multiple permanently paved 250 m stretches of Melody Roads. The first ones built included one in Hokkaido, another in the town of Kimino in Wakayama where a car can produce the Japanese ballad "Miagete goran yoru no hoshi wo" by Kyu Sakamoto, one in Shizuoka Prefecture on the ascending drive up Mount Fuji, and a fourth in the village of Katashina in Gunma, which consists of 2,559 grooves cut into a 175 m stretch of existing roadway and produces the tune of "Memories of Summer". The roads work by creating sequences of variable width groove intervals to create specific low and high frequency vibrations. Some of these roads, such as one in Okinawa that produces the Japanese folk song "Futami Jowa", as well as one in Hiroshima Prefecture, are polyphonic, with different sequences of rumble strips for the left and right tires so that a melody and harmony can be heard. As of 2016, there are now over 30 Melody Roads in Japan, with 4 in Hokkaido, 3 in Hiroshima, 2 in Shizuoka, 2 in Oita, 2 in Ehime, 11 in Gunma, and 1 each in various other prefectures. A singing road was installed near the village of Jelsum in Friesland. The Friesland provincial anthem (De Alde Friezen) would play if drivers obeyed the speed limits, otherwise the song would play off-key. After complaints from villagers, the singing road was removed. The Singing Road can be found close to Anyang, Gyeonggi, South Korea, and was created using grooves cut into the ground, similar to the Japanese Melody Roads. Unlike the Japanese roads, however, which were designed to attract tourists, the Singing Road is intended to help motorists stay alert and awake – 68% of traffic accidents in South Korea are due to inattentive, sleeping or speeding drivers. The tune played is "Mary Had a Little Lamb" and took four days to construct. As of 2010, there are three Singing Roads in South Korea; the second one, built at an unknown date, plays a traditional folk tune for guests exiting the ski resort Kangwonland. The third is located on the way from Osan to Chinhae and was built at an unknown date as well, and the title of the song it plays is currently unknown. The Civic Musical Road was built on Avenue K in Lancaster, California, United States, on 5 September 2008. Covering a quarter-mile stretch of road between 60th Street West and 70th Street West, the Musical Road used grooves cut into the asphalt to replicate part of the Finale of the William Tell Overture. It was paved over on 23 September after nearby residents complained to the city council about noise levels. After further complaints from city residents about its removal, work began to re-create it on 15 October 2008 on Avenue G between 30th Street West and 40th Street West—this time, two miles away from any residence. This road is named after the Honda Civic. It opened two days later. The new section on Avenue G is only in the far left lane of the westbound side of the road. The road appears in Honda Civic commercials. The rhythm is recognizable, but the intervals are so far off that the melody bears only a slight resemblance to the William Tell Overture, regardless of the car speed. It is likely the designers made a systematic miscalculation not to include the width of the groove in the relevant width of the spacing plus groove. This failure was made on both roads, Avenue K and Avenue G.
In October 2014, the village of Tijeras, New Mexico installed a musical road on a two-lane stretch of U.S. Route 66 which plays America the Beautiful when a vehicle drives over it. This highway is labelled NM 333, between Miles 4 and 5, eastbound. Funded by the National Geographic Society, the project was coordinated with the New Mexico Department of Transportation who described the project as a way to get drivers to slow down. ^ "Taiwan's 'musical road' unveiled". The Taipei Times. ^ a b Thyrri, Irene (October 1995). The Asphaltophone - road melodies on YouTube, TV 2/Østjylland. Accessed 20 October 2008. (in Danish). ^ Johnson, Bobbie (13 November 2007). "Japan's melody roads play music as you drive". The Guardian. Retrieved 8 May 2012. ^ "Your car as a musical instrument - Melody Roads". NoiseAddicts.com. 29 September 2008. Retrieved 20 October 2008. ^ Staff writers (13 November 2007). "'Melody Road' fascinates drivers". News.com.au. Retrieved 8 May 2012. ^ (5 December 2007). Singing Roads - Take a Musical Trip in Japan on YouTube. Accessed 20 October 2008. ^ Jake Edmiston (11 April 2018). "Netherlands destroys singing highway after villagers complained of 'psychological torture'". National Post. Retrieved 12 April 2018. ^ a b Choo, Joohee; Lee, Rebecca (29 November 2007). "Singing Streets and Melody Roads". ABC News. Retrieved 8 May 2012. ^ (20 September 2008). "Musical Road Hits Sour Notes With Neighbors". Archived from the original on 5 January 2010. Retrieved 22 October 2008. CS1 maint: BOT: original-url status unknown (link), KCBS-TV (CBS). Accessed 3 November 2012. ^ "US 'musical road' hits bum note". BBC Online. 21 September 2008. Retrieved 22 October 2008. ^ "Town Scores Encore to 'William Tell' Musical Road". Associated Press. 17 October 2008. Retrieved 3 November 2012. ^ "Musical Road Relocated, Lancaster Streets will Sing Again". City of Lancaster, California. 23 October 2008. Archived from the original on 17 July 2011. Retrieved 8 May 2012. ^ Hauxwell, Molly (17 October 2008). "Notes ring again as city re-creates musical road". AV Press. ^ Simmons-Duffin, David (23 December 2008). "Honda Needs a Tune-Up". davidsd.org. Retrieved 8 May 2012. ^ Scott, Tom (16 October 2017). "Why California's Musical Road Sounds Terrible" (Video). YouTube. Retrieved 17 October 2017. 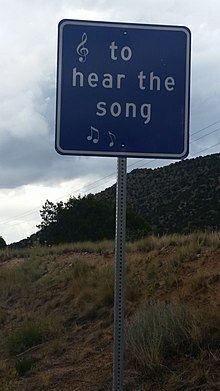 ^ "New Mexico hopes 'singing road' curbs speeding", Associated Press via Yahoo News (online), 1 October 2014. ^ "Route 66 Adds Singing Road as Speeding Deterrent", ABC News (TV), 2 October 2014. ^ "Route 66 ‘singing road’ debuts in New Mexico", KRQE News 13 (TV), 1 October 2014. ^ Nalewicki, Jennifer. "If You Drive The Right Speed, This Musical Highway Will Play You a Song". Smithsonian. Smithsonian Institution. Retrieved 21 March 2018.